An awning is a device that functions like a patio cover but isn't as structural. Awnings are made from simple posts with canvas or aluminum overhangs. The awnings are attached to house exteriors, RV trailers or even a truck. The awning is built to provide protection and a barrier between the sun and the rain. Awnings are built over doors and windows. Awnings can extend down sidewalks in front of hotels or restaurants. These awnings are called canopies. Over the years, several other materials have been used as coverings for awnings. 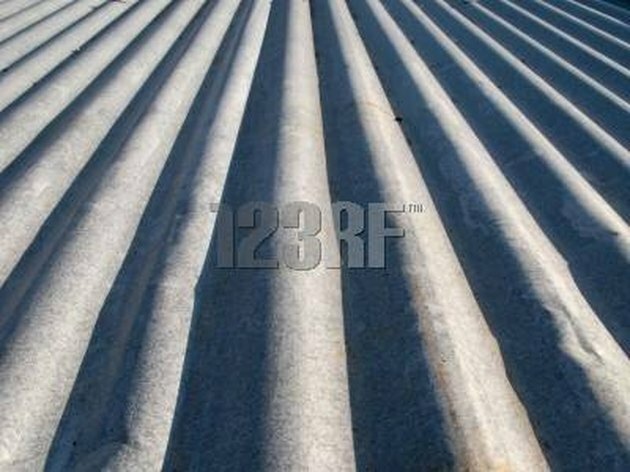 One such reliable and durable material is corrugated metal. Measure your awning dimensions. Snap a line from the house out to where the awning will extend to. Make sure the lines are straight. Place markers on the ground to mark off the area. Cut interlocking pieces of 18-inch corrugated metal to size and put it aside. Dig two holes where you placed your markers. Insert two square metal 8-foot posts. Fill the holes with concrete and let it dry for a day. Hammer a 1-by-4-by-8 ledger board on the exterior wall of the house using 16-penny nails. Make sure the nails go through the wall studs. Attach an 8-foot metal L-shaped ledger to the house and to the ledger board using 1½-inch screws. Attach a heavy-gauge C-channel metal header horizontally from one post to the other. Secure the header to the posts with screws. Insert them into pre-drilled holes with a screw gun. Lay out the pre-cut corrugated metal awning pieces across from the post header to the wall ledger. The corrugated metal pieces are about 18 inches wide and interlock. Attach each one at both ends with 5/8-inch screws. Lay them all the way across the width of the awning. How Do I Build a Roof Over a Camper for Winter Storage?